The hip joint is made up of two bones- the femoral head (the ball) and the acetabulum (the socket). Cartilage, a connective tissue which lines the surface of these bones, helps provide shock absorption and increases stability & congruency at the hip joint. The hip joint is most often damaged by disease such as arthritis or by trauma from falls or other accidents. Aging, congenital abnormalities, obesity and prior trauma to the hip joint can also result in deterioration of the cartilage at the hip joint. As a result of disease or trauma to the hip, the articular cartilage can wear away resulting in the exposure of bone. When bone is exposed it is susceptible to further damage as it rubs up against other exposed bone. This rubbing of the bone can eventually result in symptoms such as pain, discomfort, tenderness, and limitations of movement at the hip. These symptoms would often cause limitations with walking, transferring & performing other activities which may require weight bearing. 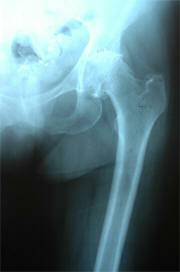 The image provided displays an x-ray of a hip with deterioration of the cartilage on the femoral head. Conservative approaches such as pain & anti-inflammatory medications, physical therapy, cortisone injections, weight loss and activity modification are often tried first. Depending on the stage of the disease or extent of damage to the knee, a total hip replacement may be the only reasonable solution. A Total Hip Replacement is a surgical procedure which involves the removal of the diseased bone and the reconstruction of the anatomy with an artificial joint called a total hip prosthesis. The components of the prosthesis are designed to act like the normal joint. There is a femoral stem- a metal component that is placed into the thigh bone, and an acetabular cup- a plastic and metal component that is placed where the socket was. There are two goals with a Total Hip Replacement: 1) reduce or eliminate pain and 2) restore function by improving the movement of the joint. The image provided displays an x-ray of a total hip replacement where the femoral head and acetabulum have been replaced with a prosthesis. After surgery, patients are instructed to follow general hip precautions which includes: 1) not crossing the involved leg over the uninvolved leg, 2) not bending at the waist past ninety degrees and 3) not turning the foot of the involved leg inwards as these actions increase the risk of dislocating the replaced hip joint. 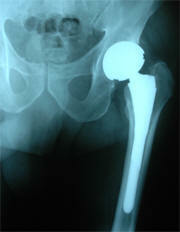 For more information on a total hip replacement please consult with your physician or visit www.comportho.com. To view and interact in a virtual hip surgery, please click on Edheads.org- Virtual Hip Surgery. Status Post Total Hip Replacement Treatment Options for a P.T.